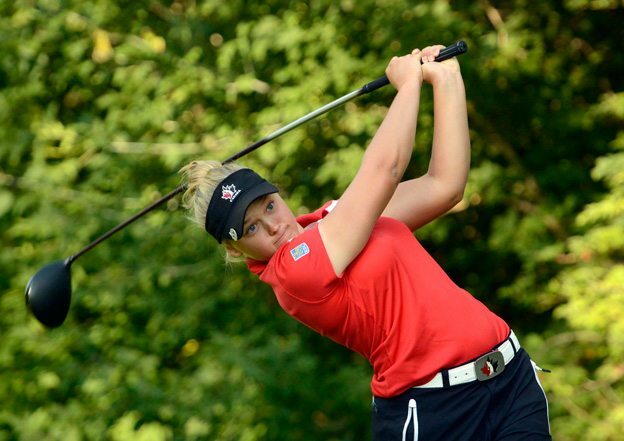 At 16, Brooke Henderson is considered one of Canada’s brightest golf stars. The Smiths Falls native is an average teenager in many ways, but her drive and passion are the envy of many twice her age. Lisa Wallace catches up with the young golf phenom, who is currently ranked second in the world as a female amateur. I started playing for fun when I was three and first started playing competitively when I was nine. What drew you to golf? I grew up watching my sister, Brittany, who is six years older. I’ve always looked up to her and would watch her play, so when I was really young, I grabbed a club. My dad used to play, too, so he got us both into it. I used to play hockey. I was a goalie and I really enjoyed it. I played until I was 14, but then I made the Canadian national [golf] team and I was always travelling, so it made it hard on my team — and me — to be committed to both. I decided just to go with golf. I love spending time at my cottage. Spending time with my family and friends. I love swimming and playing golf. I always have fun when I play. You committed to the University of Florida for your college education. How do you juggle training with your schoolwork as a grade 11 student? I go to Smiths Falls Collegiate, and last semester I took two classes there and three classes online. All my teachers are very supportive and really help me catch up when I travel. I love going to school, so it’s fun to still be able to take part in that and still practise and play golf. What is your favourite golf moment to this point in your career? Last year I got to play in the U.S. Open and made the cut and had my sister caddy for me. I got to play with Morgan Pressel, who I really looked up to, in the third round and had a lot of family and friends there to watch. It was a great experience and I learned a lot from it. I would like to keep in the top three in the world on the amateur rankings this summer and keep working to get to the top of the leader board. I want to qualify for the U.S. Open again, and at the end of the summer, there’s the World Amateur Championship in Japan, where I would like to contend for the championship. How challenging is it to work on your game considering the harsh winter climate you have to deal with living in Smiths Falls? It is challenging, but sometimes it’s nice to get that break because of the weather and you get to relax a bit. This past winter I spent two months in Florida. When I’m home, there’s an indoor golf school here in Smiths Falls that I can practise at. Sometimes I wish I was down South all winter, but I love being from the Ottawa area. What do you love most when you’re on the course? I love how quiet it is. I love early-morning tee times, when the dew is on the grass and you can smell how fresh everything is and all the little animals running around. Even if you’re having a bad day, you can think through all your problems and be relaxed. It’s just so nice to be out there.